China’s One Child law, which took effect in 1979, has meant that couples with more than one child would be fined or otherwise punished, There is a cultural preference for boys in China, and so girls have often been abandoned (or aborted or murdered). A trickle of adoptions from China began in the early 1980’s. Some 70,000 Chinese baby girls have arrived in the US for adoption since the early 1990’s. Thousands more were adopted to Canada, western Europe, and Australia. Most were under 3 years old, so most are now reaching adulthood. The One Child law has created controversy in terms of ethics and economics; these controversies are familiar territory for international adoption as well. The policy has also, not surprisingly, created a range of responses from poets, filmmakers, writers, sculptors, and other artists, in China and around the globe. You’ve perhaps heard of the astonishing Terracotta Army, a huge collection of sculptures buried underground in Xi’an with the first emperor of China, around 210 BC. They were discovered in 1974, and consist of over 8,000 soldiers, plus chariots, horses, and more. A Wikipedia article called “Terracotta Army” is here. If you are in Bern, Switzerland, you can see “Qin–The eternal emperor and his terracotta warriors” on display through November 7, 2013, at. The warriors will be on display at the Children’s Museum of Indianapolis in May 2014. The Indy museum is the world’s largest children’s museum, by the way. Of course, the best place to view the warriors is in Xi’an itself, of course. It was a TripAdvisor.com Travelers Choice 2013 Winner. So what is the connection among art, Chinese baby girls, and the Terracotta Army? “Huiyun started her life in the garbage. As an unwanted baby girl, her parents abandoned her in the poor province where she was born in central China. There, a pair of refuse collectors found her with her umbilical cord still attached. They kept her, bringing her up as their own. You can find the rest of the BBC article here. As a writer and artist, I find this work evocative and challenging. 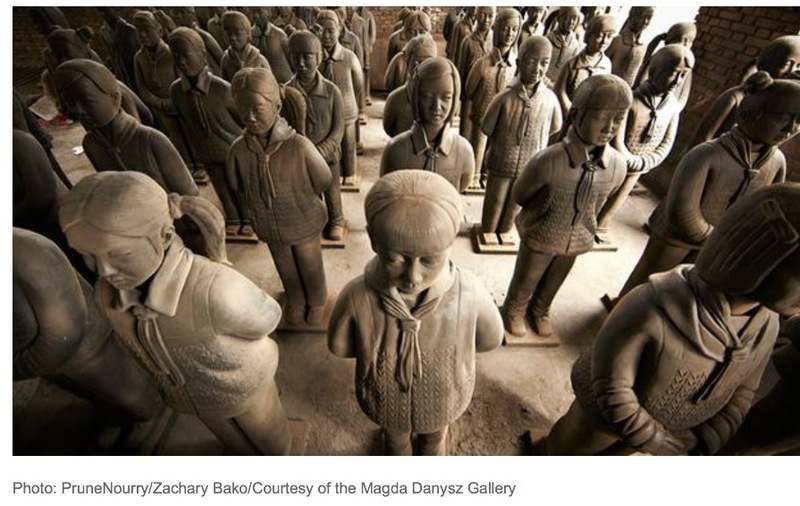 “An army of school girls.” Terracotta Daughters: yet whose daughters are they? And of course, there is an army of Chinese adult adoptees as well, and I mean that in the most empowering and respectful sense. Baby girls, and adopted children, grow up. Some choose to travel back to China, to explore the culture, to search for family, to re-connect as Americans, as Chinese-Americans, as immigrants to America, as Chinese adults. The acclaimed documentary Somewhere Between follows 4 young women adopted from China as they consider identity, loss, ethnicity, race, and more. We can learn so much by listening to their journeys and stories, as well as those of the Terracotta Daughters.